Sen. Mike Lee (R., Utah) is blocking the confirmation of Joseph Macmanus, a career foreign service officer nominated to the post of U.S. ambassador to Colombia. 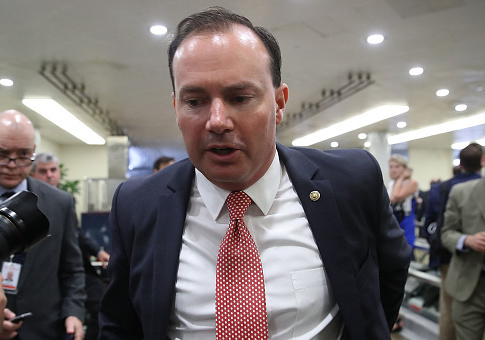 "Sen. Lee still has his hold on Macmanus, and we have no plans to lift it," Lee's spokesman told the Washington Free Beacon Friday. Senators can single-handedly prevent any presidential nominee from receiving a vote on the Senate floor through a parliamentary procedure known simply as a "hold." The hold can last for the rest of the congressional year and force President Trump to either nominate a new person for the role or wait until January when a new Congress begins to nominate Macmanus again. Macmanus's nomination was already uncertain in the wake of Secretary of State Rex Tillerson's departure and Trump's decision to replace him with CIA Director Mike Pompeo. Trump's Thursday decision to oust national security adviser H.R. McMaster and bring in John Bolton increases the probability that Trump will dump Macmanus for a new nominee who can pass Senate muster and alleviate Lee's and others' concerns, according to several Capitol Hill sources. Macmanus served as one of former Secretary of State Hillary Clinton's closest aides and was one of the first of her staffers to learn of the 2012 attacks on the U.S. consulate in Benghazi, Libya, that killed U.S. Ambassador Chris Stevens and three other Americans. Along with Lee, GOP senators Ted Cruz of Texas and Marco Rubio of Florida also have voiced concerns about Macmanus's close ties to Clinton and his role in helping Clinton handle the aftermath of the Benghazi attack. Tillerson and Tom Shannon, his right-hand man at State who is also leaving the department soon, have strongly supported Macmanus's nomination over concerns from some White House staff that he is not the right person for the top diplomatic job in Colombia, the top U.S. ally in Latin America. Pompeo and Bolton, both outspoken critics of Clinton's handling of the Benghazi attack, likely will share some of the same concerns senators have voiced about Macmanus on the issue, as well as several others related to Colombia and U.S. policy there. During Macmanus's confirmation hearing, Rubio pursued a line of questioning aimed at trying to determine if Macmanus has any culpability for supporting or failing to debunk the Obama administration's initial public explanation that the Benghazi attack was the result of a spontaneous reaction to an anti-Islamic video. Macmanus said he called the incursion on the U.S. consulate in Benghazi a terrorist attack almost immediately upon learning about it because he believed that's what it was. However, he said his early impression was not a "legal determination." He also swore that he never intentionally misled the public about the nature of the attack. Rubio wasn't entirely satisfied with the responses and after the hearing said he remains concerns about Macmanus's ability to "effectively represent the United States as ambassador to Colombia." "The confirmation process is still ongoing, and the nominee will have an opportunity to address further questions," Rubio's spokesman said in early March. Another sign of uncertainty regarding the Macmanus nomination is his nomination's failure to move to the Senate floor for a vote this past week. The Senate on Thursday confirmed two other State Department nominees who were testifying alongside Macmanus at the confirmation hearing, Edward Prado as ambassador to Argentina and Marie Royce to be assistant secretary of state for educational and cultural affairs. With Pompeo and Bolton at the foreign policy helm at State and the White House, conservative critics believe Trump will follow through on this tougher approach to Latin American and eschew President Obama's softer diplomatic policies. "Pompeo's business background and political skill will serve U.S. interests well particularly in Colombia where the U.S is trying to curb record illicit coca production and open transportation and pharmaceutical markets further for U.S. businesses," said Bill Burlew, executive director of the U.S. Colombia Business Partnership and a former GOP congressional staffer. "Both [Pompeo and Bolton] will have a no-nonsense approach when it comes to dealing with the Colombian government on reducing cocaine output likely insisting on a resumption of aerial spraying as a proven method for reducing coca crops," Burlew added. Just before Tillerson's trip to Peru and Colombia in February, Trump made an oblique reference to Colombia, publicly complaining that unnamed countries were "pouring drugs" into the United States and "laughing at us" for continuing to give them aid. Trump's budget requested a deep cut in aid to Colombia for the next year, from $391 million in 2017 to $140 million for spending through Sept. 30, 2018. Rejecting Trump's recommendation, Congress in the omnibus maintained aid to Colombia at its current $391 million amount. This entry was posted in Issues and tagged John Bolton, Marco Rubio, Mike Lee, State Department. Bookmark the permalink.